The Museum is housed in the Zimmerman House which was built in 1901 by Earnest Campbell and sold to E.H. Zimmerman in 1913. The Zimmerman family lived in the house until 1956 when it was purchased by the County. 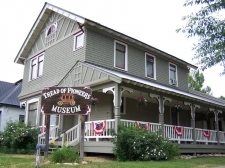 The Tread of Pioneers Museum opened in the house and was founded in 1959 by a group of Routt County residents concerned with preserving the memories and artifacts of Routt County's unique and colorful past. The Museum's name is derived from a John Greenleaf Whittier quotation: "I hear the tread of the pioneers of nations yet to be, the first low wash of waves where soon will roll a human sea." 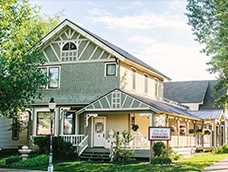 The Tread of Pioneers Historical Commission was envisioned and founded in 1959 by a group of Routt County residents concerned with preserving memories of Routt County�s unique and colorful past. The original founders felt it was important to preserve the objects, documents, and memorabilia of Routt County for future generations to see, understand and appreciate. The Commission founders spearheaded the project by collecting papers, pictures, documents, and objects from friends, neighbors and other members of the community, along with other information on the local history of families and communities. A Board of Directors was formed, policies were established, and the Tread of Pioneers Museum opened in the summer of 1959 in the historic Zimmerman house located on the corner of 5th and Oak (now the courthouse parking lot). In their February, 1959 Board meeting, the minutes state that �...the Museum should be governed by a Board of Trustees, composed of interested and influential citizens. This governing Board should formulate the policies under which the work of the Museum is done, and be responsible for the economic stability of the institution. The Museum should have a full-time staff, the members of which are capable of carrying out the mandates of the Board within the limits of the physical and financial facilities available to them.� When the Museum first opened, all of these goals were not fully met. For the first 29 years of operation, the Museum was open only in the summer, and was staffed completely by volunteers. Furthermore, the Museum was run on a limited budget made up of donations given at the door, and memberships. In 1988, the land used by the Museum was needed by the County to expand the Courthouse, and the Museum was forced to move. The Board of Directors began the task of moving the Museum�s historic Zimmerman house and the collections to a new location. Remodeling and building an addition (the Gallery) was also required. Future expansions were also planned during this time to enable the Museum to create more display and storage space and community meeting areas. The Museum�s move served as an impetus to expand the Museum�s operations from a volunteer staffed and operated organization to one that employed at least one full-time employee to oversee the Museum�s activities. In the process, the Museum has become more cohesively operated and has taken a more active role in the community by hosting more events, programs, lectures and community outreach activities. Since its move from behind the Courthouse, the Museum has seen enormous growth. The expansion continued in 1997, when the Utterback House, which was located at Oak and 4th Street, was donated to the Museum by Karin Utterback Normann. A campaign ensued and funds were raised to move and remodel the Utterback House. Many dedicated volunteers worked on the project. Ultimately, this house has provided room for a Community Room for meetings and social activities; office space for staff and volunteers; a modern kitchen; and space for the Lufkin Library research center, which houses the our research and genealogy files, oral histories, local books, historical videos, etc. In 2003 a county-wide .3 mill levy was passed to fund museum and preservation services. This mill levy does not sunset, it is continual. During the same year, the museum Board of Director�s made the decision to keep the museum at the present site in the future. Since the mill levy passage, we are proud to have accomplished so many of our long-term goals and increase the services that we provide to this community. The Museum had outgrown its current space and ability to serve its visitors and honor its contributors. We completed a capital campaign to build a $1,000,000 facility to include additional display space with new exhibits and an environmentally controlled collections building. We broke ground on the project in April of 2012 and completed the project at the end of February 2013. Grand opening events featuring our entire new facility commenced Feb. 28-Mar. 2, 2013. This project could not have been possible without the generous bequest from the estate of Gloria Gossard. Her signficant contribution turned this project dream into reality. We secured grant funding in the amount of $117,000 for the project from the following foundations and agencies: Gates Family, Boettcher, El Pomar, Museum and Heritage Fund, Colorado Group Realty, and TIC. We also want to thank the Allbright, Andrews, Chaney, Crawford, Dittman/Huffington, Fraser, Hefty, Orton, Sprengle, Steinberg, Summer, and Swanson families for their generous support of this project.